We’ve got the best Cinderella Party Ideas right here for the most magical Cinderella Themed Birthday Party your princess has ever seen! Is Cinderella your little girl’s favorite princess? 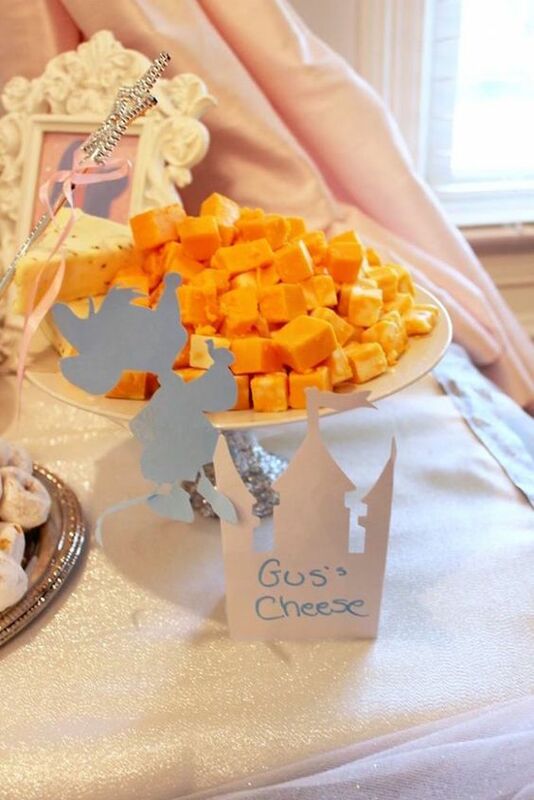 Then why not make her princess dreams come true and throw her a beautiful Cinderella themed party? The beautiful pale blue gown with magical silver sparkles is such a wonderful color theme that it inspires so many gorgeous Cinderella birthday party ideas all over the world! This timeless fairy tale will definitely make for a very charming party for your little princess — one that she will love looking back on for many years to come! Are you looking for Cinderella themed party ideas for your toddler? Whether you want ideas for centerpieces and table decorations to food, games, activities, and party favors, we’ve got you covered! 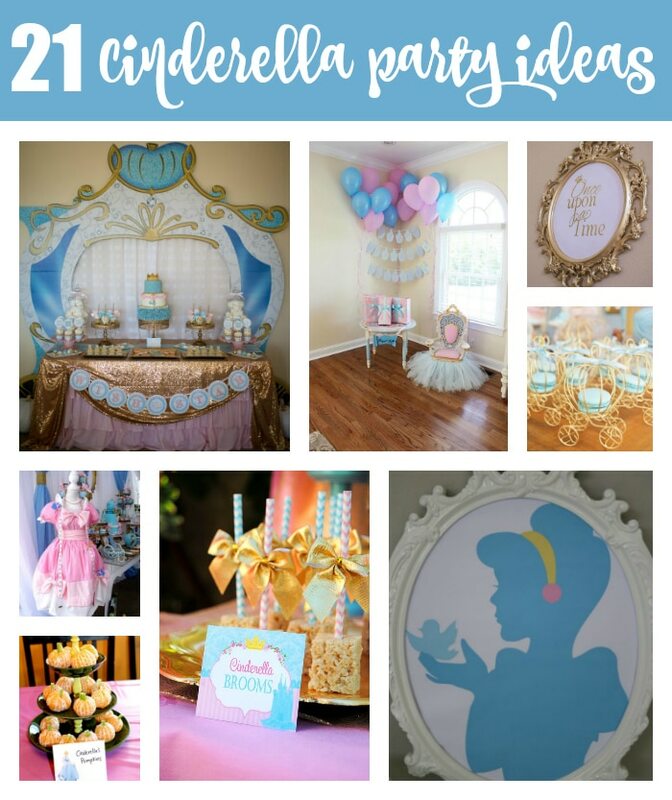 Check out these 21 magical Cinderella birthday party ideas! 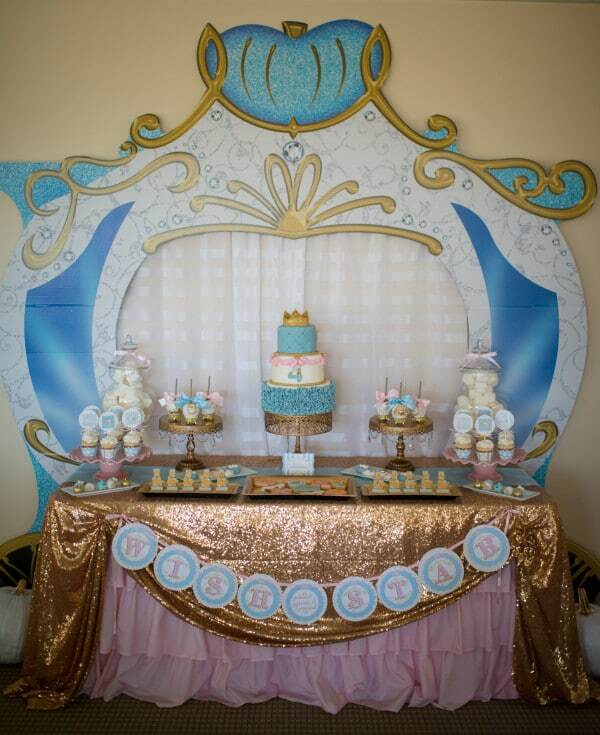 Magical Cinderella Birthday Party Idea #1: This stunning Cinderella Party Dessert Table looks incredibly regal and absolutely perfect for your little princess! From the wonderful carriage backdrop to the sparkling gold tablecloth, this dessert table setup will have the guests at your Cinderella party mesmerized. Magical Cinderella Birthday Party Idea #2: Looking for Cinderella cake ideas? Look no further! This Cinderella Birthday Cake is going to look smashing on your dessert table! 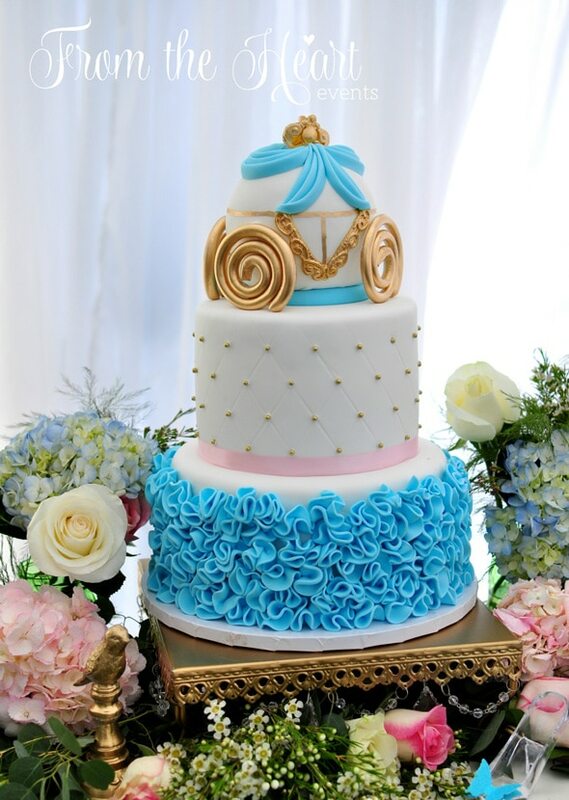 The beautiful blue frosting looks perfect, but what really takes the cake is the adorable carriage-inspired top tier! With pretty gold accents and a classy pink ribbon, this cake is perfectly royal. 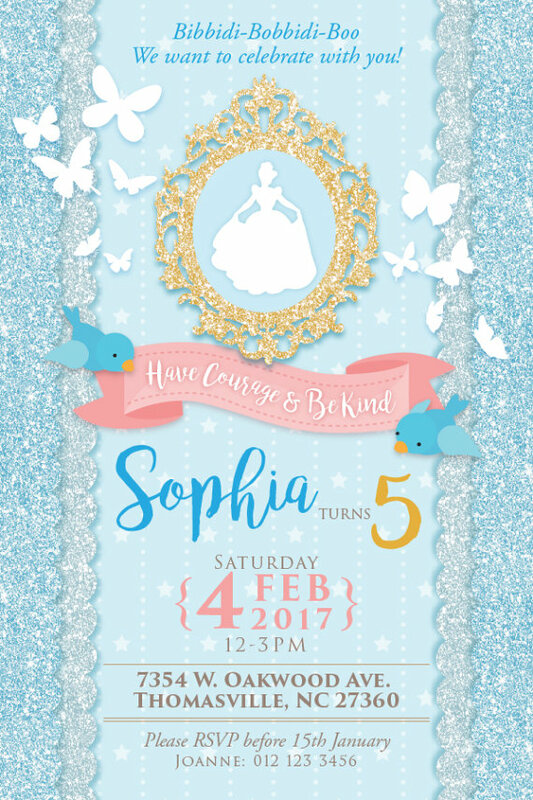 Magical Cinderella Birthday Party Idea #3: Let your party guests know that you’re throwing a beautiful ball with this pretty Cinderella Invitation! This cute little invitation is the perfect little DIY project if you want to try your hand at craft making for your little girl’s party. Magical Cinderella Birthday Party Idea #4: No Cinderella birthday party will be complete without Cinderella Glass Slippers! 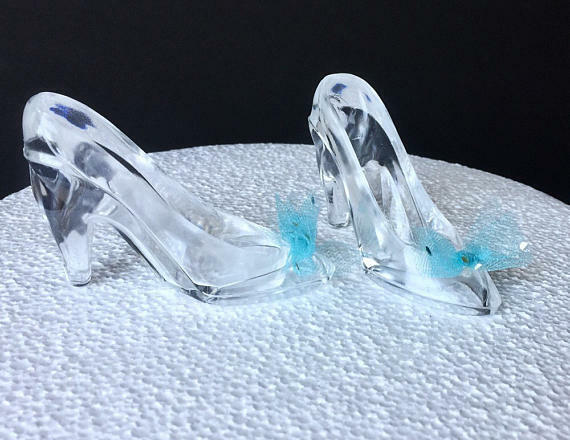 These gorgeous glass slippers will look great as a cake topper, as party favors, or as one of your Cinderella party decorations. You can find glass slippers like these on Etsy or local stores that sell Cinderella party supplies. 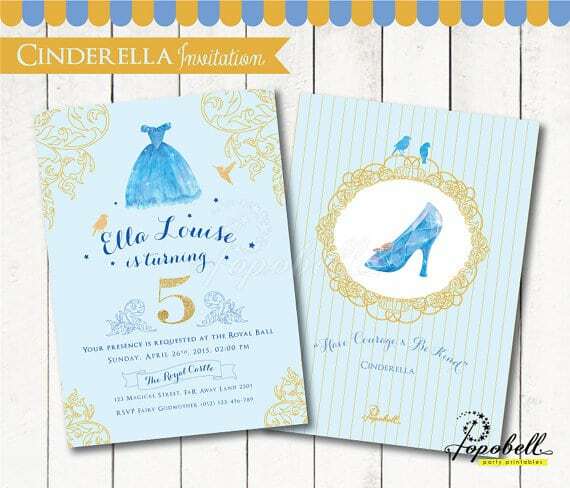 Magical Cinderella Birthday Party Idea #5: Here’s another beautiful Cinderella Party Invitation. With pale blue and gold accents and delicate drawings and lettering, this party invitation looks like an absolute classic royal ball invitation! 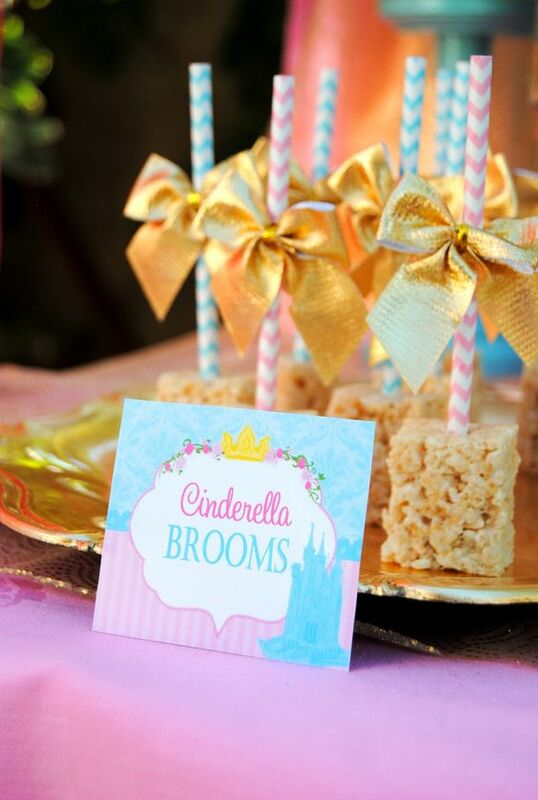 Magical Cinderella Birthday Party Idea #6: How creative are these Cinderella Broom Rice Krispie Treats?! 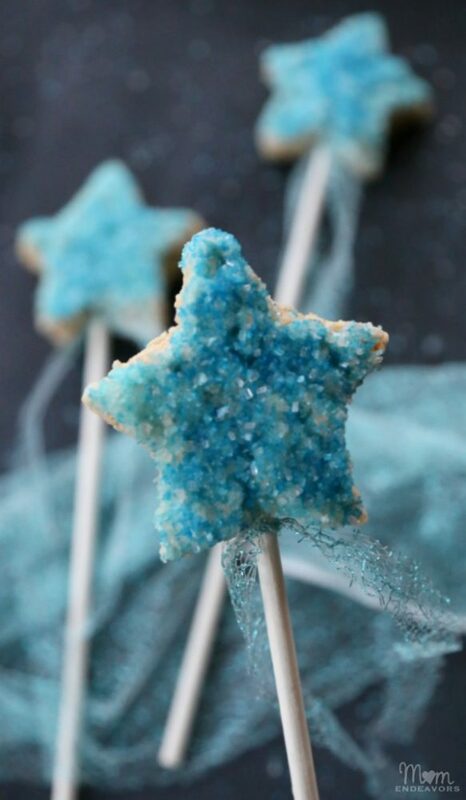 Remind the little ones of Cinderella’s amazing journey with these cute Rice Krispie broomsticks. Rice Krispies are one of the easiest desserts you can make, so make these to fill up the dessert selection at your party. Magical Cinderella Birthday Party Idea #7: Wow! 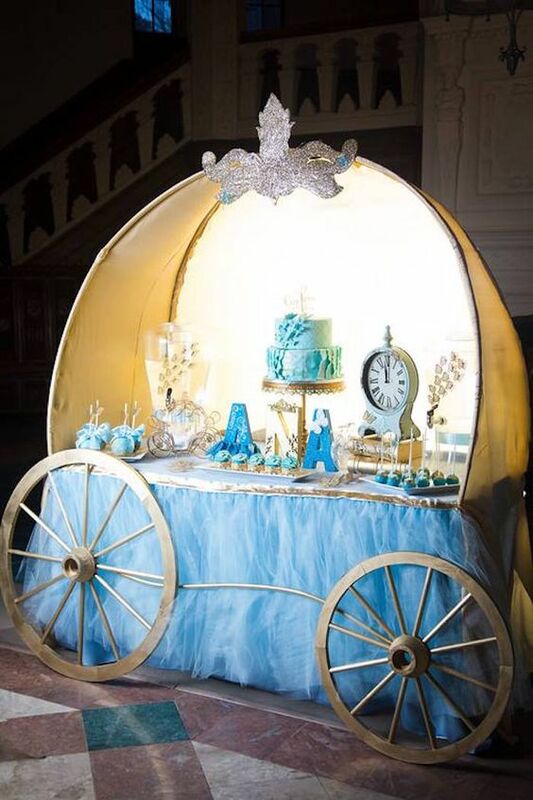 This Cinderella Carriage Dessert Table looks stunning! The individual elements and the scrumptious desserts look amazing, but what really makes this carriage dessert table standout is the bright background. If you want a challenging but fulfilling DIY project, this is it! Magical Cinderella Birthday Party Idea #8: This Cinderella Frame is the perfect understated but classy decoration for a Cinderella-themed party. 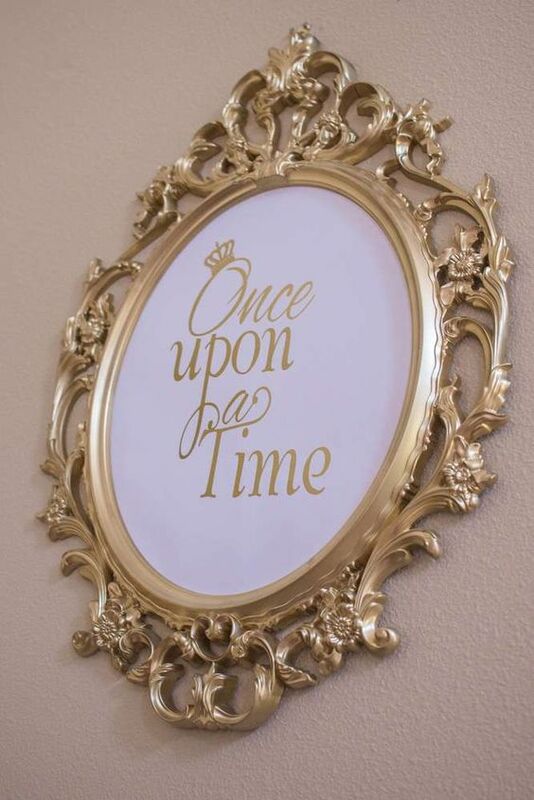 Just get a couple of golden frames or paint some frames gold, print out several Cinderella inspired quotes and voila! 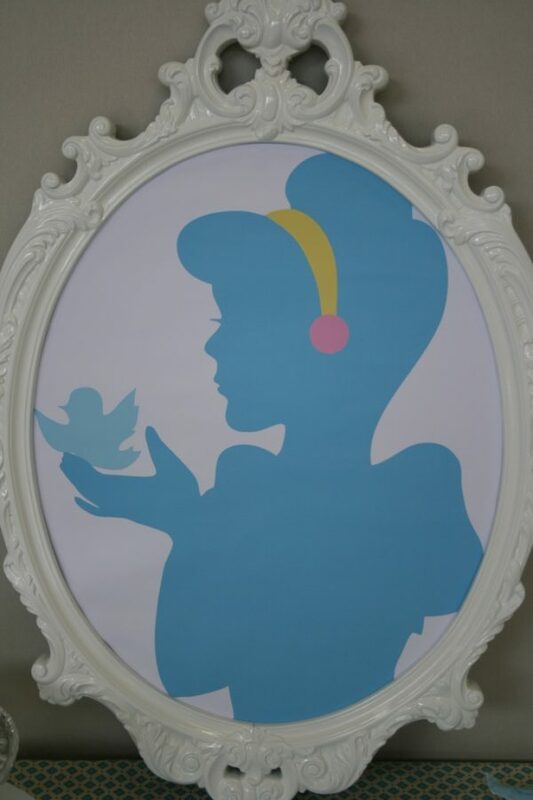 You’ve got yourself some amazing custom Cinderella party decorations! 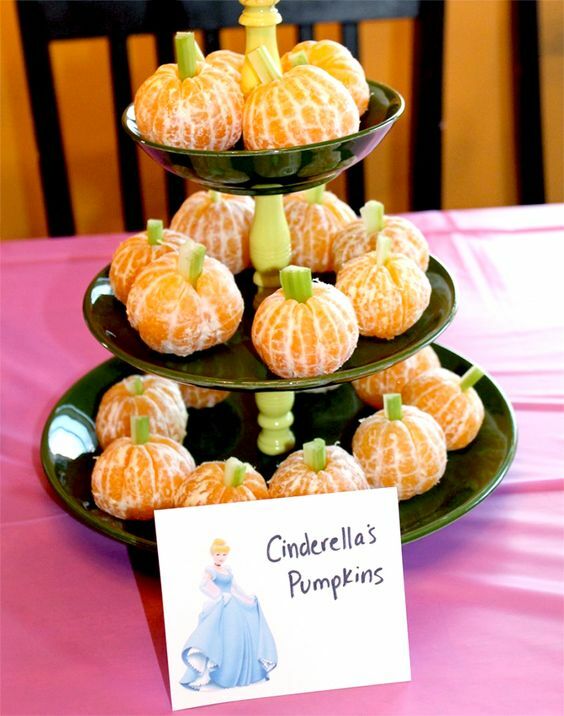 Magical Cinderella Birthday Party Idea #9: How cute are these Cinderella’s Pumpkins fruit display? If you want to serve a healthy dose of fruit, these oranges snazzed up as Cinderella’s pumpkins are going to be perfect! Magical Cinderella Birthday Party Idea #10: More picture frame decorations! 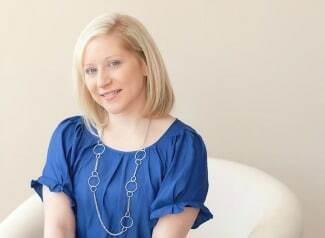 This white Cinderella Frame is another great option if you can’t find some golden picture frames or if white fits in with your party theme better! 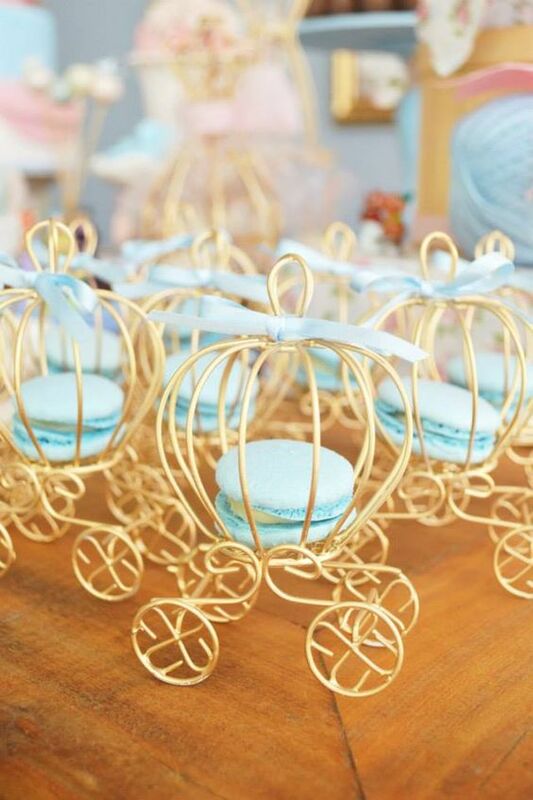 Magical Cinderella Birthday Party Idea #11: Aww, these cute little macarons in tiny golden carriages look almost too good to eat! If you want to add something to your dessert table that will undoubtedly impress all your guests, these Mini Cinderella Carriages with Macarons are the way to go. Macarons can be a bit tricky if you make them yourself, but you can always get delicious ready-made macarons from a local baker and just put them into cute golden wire carriages like these ones! 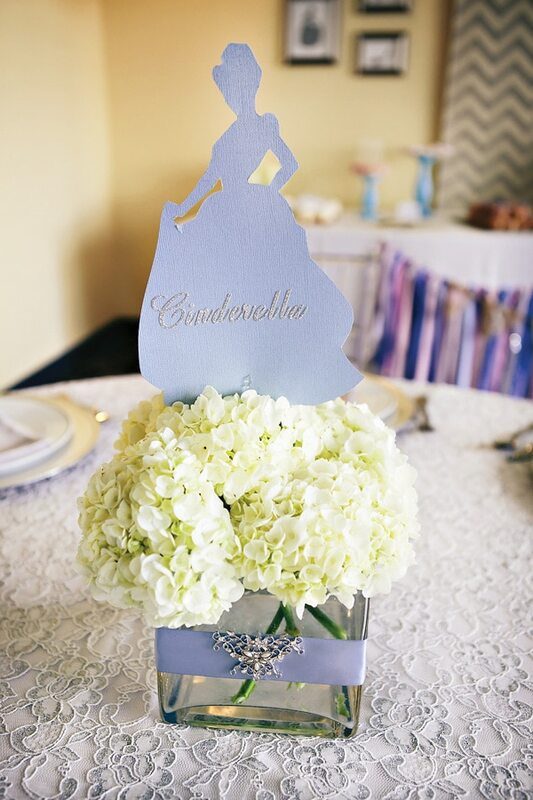 Magical Cinderella Birthday Party Idea #12: This Cinderella Flower Centerpiece is going to be the perfect classy and romantic centerpiece for your little princess. You can even make them yourself if you love arranging flowers! 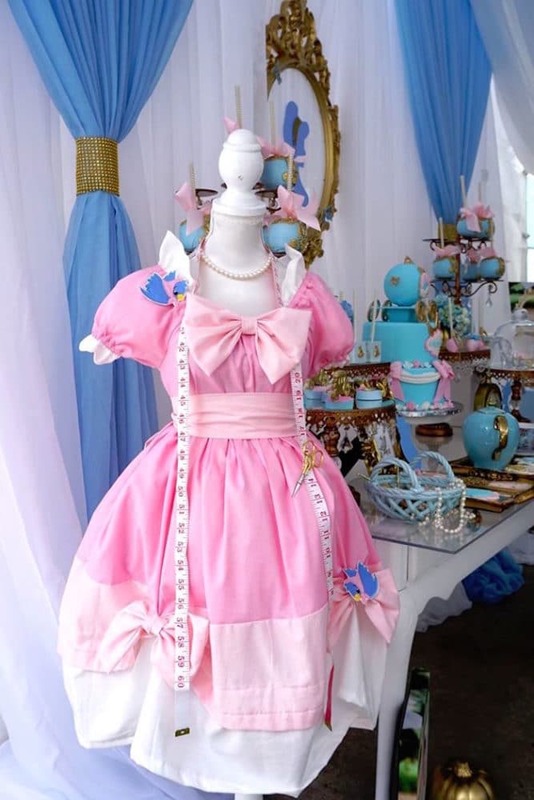 Magical Cinderella Birthday Party Idea #13: This adorable Cinderella Dress will look adorable as a centerpiece! The cute little birds as Cinderella’s dressmaking helpers really complete the look. 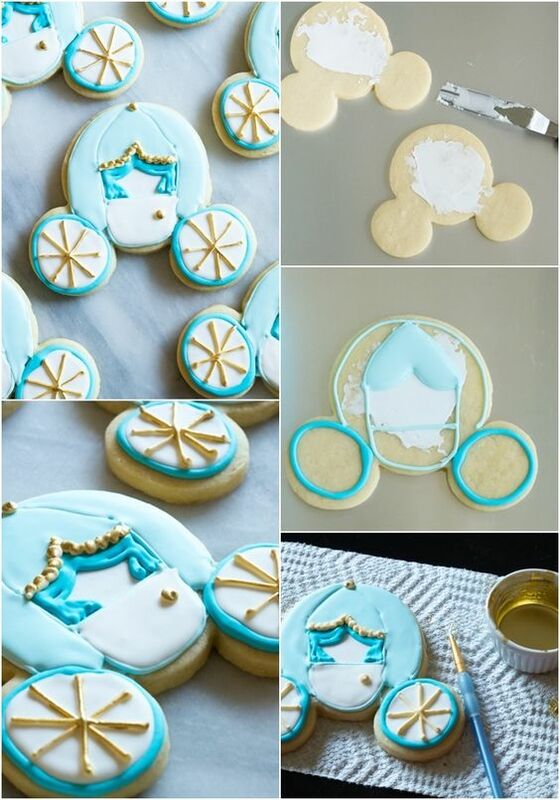 Magical Cinderella Birthday Party Idea #14: These Cinderella Carriage Cookies are beyond adorable! If you want desserts that are fun to make but don’t require expert baking skills, you can make these cute Cinderella carriage sugar cookies easily. Magical Cinderella Birthday Party Idea #15: Dreams do come true! The little ones at your party will enjoy making each other’s dreams come true with these lovely Cinderella Magic Wand Treats. 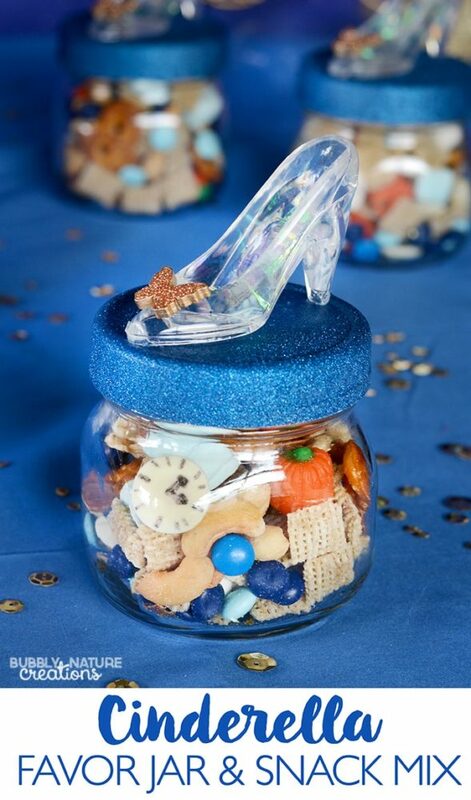 Magical Cinderella Birthday Party Idea #16: Now this Cinderella Favor Jar Snack Mix is a party favor that your guests will love to take home! Not only are the yummy treats inside a great party favor, this delightful Cinderella jar is something that they can reuse too. This is an excellent and practical party favor. Magical Cinderella Birthday Party Idea #17: This DIY Cinderella Pumpkin will look smashing as the centerpiece of your dessert table! 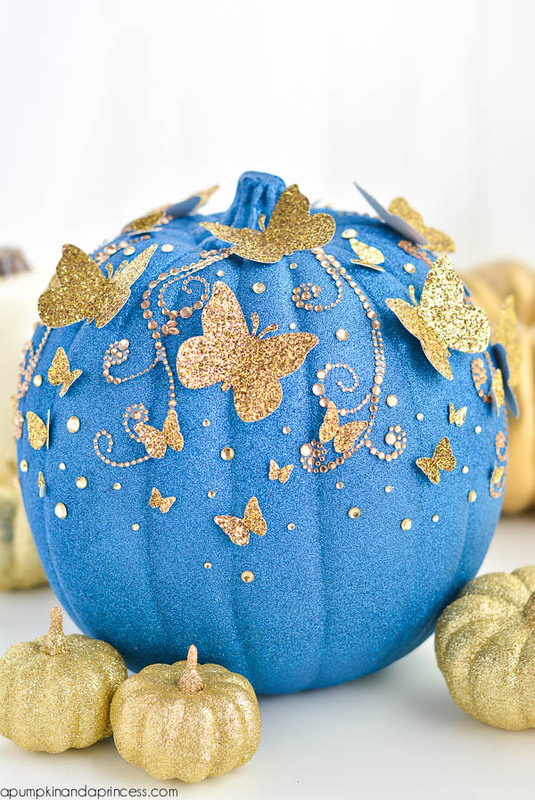 This pretty faux pumpkin is a great DIY for your party! Magical Cinderella Birthday Party Idea #18: Don’t forget Cinderella’s trusty mouse friend, Gus! This Gus Cheese will make a delicious salty break from all the sweets served at your party. 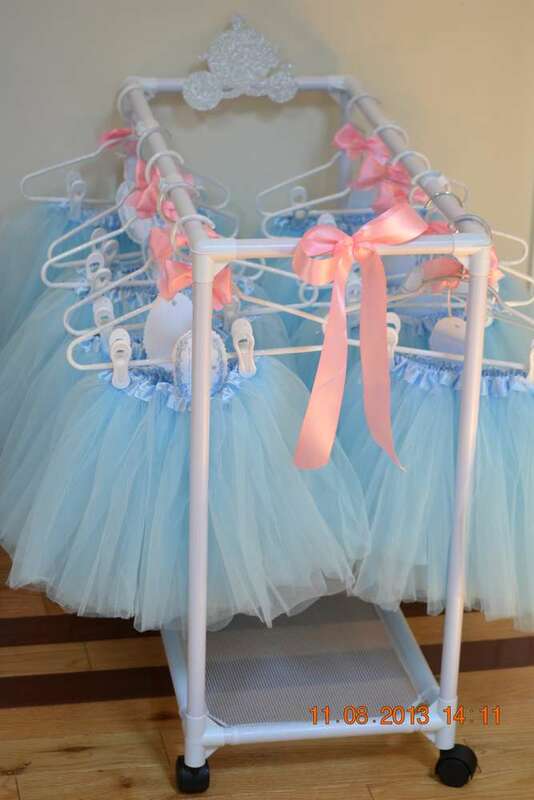 Magical Cinderella Birthday Party Idea #19: These Cinderella Party Favors / Dress Up is sure to delight all the little girls who are dreaming to be a princess! 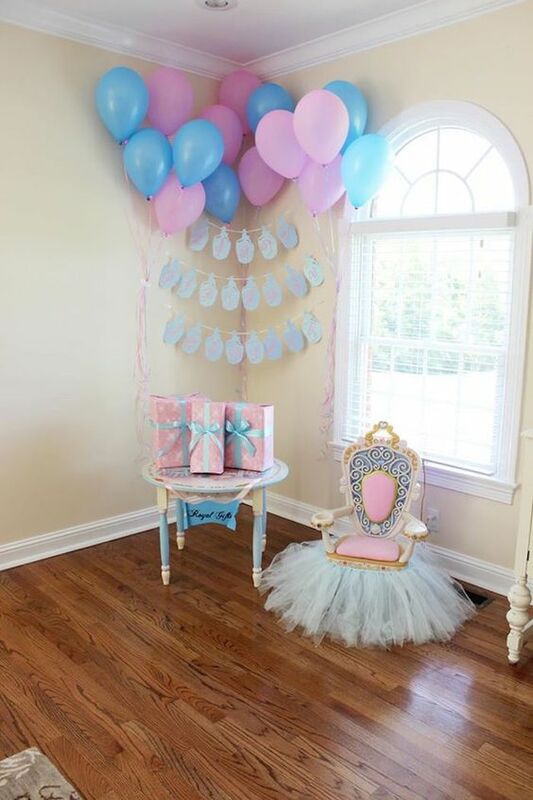 Magical Cinderella Birthday Party Idea #20: If you want a cute little spot where your little girl and her other pretty guests can have a memorable photo, try having this Cinderella’s Royal Corner at your party. 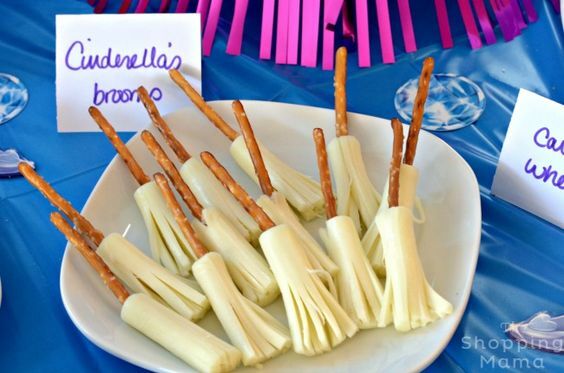 Magical Cinderella Birthday Party Idea #21: Last but not least, these Cinderella Broomsticks are another endearing addition to your snack table. It’s super easy to make too with just pretzel sticks and string cheese. Which of these 21 Magical Cinderella Party Ideas are your favorites? Let us know in the comments below!